Commercial ships transports roughly 90% of the world's goods. Environmentally speaking the price for this transportation is the app. 3% CO2 emission that shipping is accountable for. The emission of CO2 is an important issue for shipping, but there are other negative emissions related to operation of commercial ships. 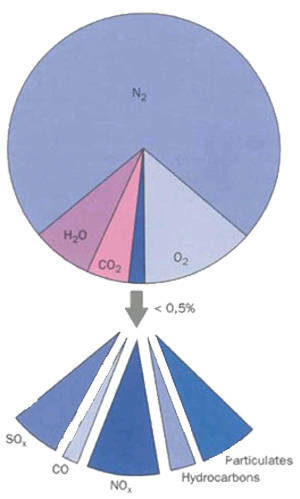 Figure 37 – Marine Diesel Exhaust Emission Composition. Traces of other gasses such as argon and micro pollutants in trace quantities such as polycyclic aromatic hydrocarbons (PAHs) and dioxins. The composition of normal exhaust from a ship engine is illustrated in Figure 37. While CO2 and SOX and partly PM are proportional to the amount of fuel burned and the sulphur content respectively the remaining emissions HC, CO and NOX vary largely with engine load.